Another week, another end of February and that meant a busy week at school with not only pancake day and World Book Day. N has mixed views on both although anything involving food is going to win with him. Onto this week’s School Days goings on. N loves books, he loves stories (as long as someone else is telling them to him), and he likes the activities they have around World Book Day. But dressing up doesn’t happen. Last year I got Horrid Henry colour jumper and fabric for yellow stripes ready and he refused to dress up. This year I’d mentioned going as Horrid Henry this year – I mean, it’s basically a jumper the colour of his school uniform anyway and jeans. He debated it and said yes a couple of months ago, but the Sunday before said he wasn’t dressing up. I then suggested George’s Marvellous Medicine and going as George. Simple top and trousers, a medicine bottle and spoon. Easy, and not extreme dressing up by any means. But no, he was going in school uniform. At the end of the day he came out excited, telling me who had dressed up as what (his cousin was a pirate but not from a specific book). He thought there were too many people dressed as Harry Potter (why mummy?) and the best costume was a boy in year 4 dressed as a burglar So N has now pretty much changed his mind and has decided that next year he’s going to be Burglar Bill. I’ll believe it when I see it. The school also do a book swap, so anyone who brings in a book can take home a different one. We’ve just done a clear out, but N went in with a rather young picture book. He came home excited about a minibeasts one he chose, until we read it at bedtime and he pronounced it boring 4 pages in. Despite N being only one of the handful of children who didn’t dress up, and the agony of parents having to make or buy costumes, I always think it’s sad when schools don’t do anything for World Book Day. Pancake day means pancake races at N’s school, so I had to send him in with a pancake and frying pan. He had a pan from last year (complete with name written on by Chalkola pens) and that morning I was up making a pancake at 6am! I tried to fob him off with a tortilla cut to size, but he turned that down. N wasn’t impressed with the race because apart from reception who have their own race, the other races are by class, for boys and then for girls. So N’s year were running against the year 2s who obviously were much faster. ‘It’s not fair running against the year 2s mummy’. Fair point, but it would take too long between the rain to get through double the number of races. I’d expected him to have pancakes at lunch at school, but they didn’t have them, and he was most put out by the mini ones they had at after school club. He had good pancakes with us at home though. I’ve written before about friendship woes, and earlier this week was pretty sad. When I asked who N played with he told me he’d hung around with the TA in the playground because everyone was playing in pairs. Supposedly his best friend and another had run off from him, and the other people he’s really friends with was whacking things with another child and N didn’t want to do that (thankfully). I suggested some other children asking why he didn’t play with them, and was told N didn’t want to play what they were doing. I suggested doing a challenge and choosing someone before breaktime to ask if they wanted to play with him. But N was worried because he said he didn’t know any games to suggest. He just needs to make more of an effort and ask to join in. The next morning I checked that N remembered what we’d talked about. ‘No. But playing in pairs is just a Tuesday thing’. Oh, so maybe he wasn’t too worried after all. On Wednesday N still couldn’t really remember if he’d played with anyone, but his cousin was back at school after being sick later in the week and all was fine again. Back playing with him, his friends and friends from his own class. Phew. This week N’s had to make do with random water bottles. He left his green water bottle somewhere (it has his name on). It wasn’t at school or after-school club, wasn’t in the car or house. The only other place it could have been was in a car of a parent who does the school to after-school club run. The bottle finally appeared a week later! Thankfully, so I’ve not had to send N in to school with my spare pink water bottle but I can’t believe that the parent didn’t check the car each day after having other children in it. I know I do because they always leave something. Bizarrely, along with the water bottle a school jumper turned up as well. I hadn’t even noticed we were missing a jumper, but it’s reassuring most do turn up again at some point. How’s your school week gone? Or have you been preparing for being back at school? Link up your school themed posts. Unfortunately with any linky there has to be a few rules. 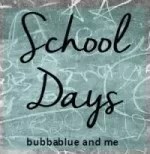 1, Link up 1 or 2 posts that have a school days theme to them. It could be what’s been going on that week or month, a specific school performance or achievement, hints and tips about schools or even a rant about education. 2, Please link back or add the badge to your post(s). The linky’s open until Saturday, and I’ll read, comment on and share every post linked up. Sounds like an eventful week! I really hope his friendships are back on track now. Our school didn’t dress up for World Book Day, which I think most parents were happy about, but the kids got to take a favourite book in and to read with younger children. What is it with boys and losing stuff?! My younger son is forever losing stuff! To be fair to N, we do end up with extra things being put in his PE bag – I presume because he’s usually the one losing things, so they just assume they’re ours. Despite the fact it might be a girl’s cardigan or have labels in! At least we do get them back which is a bonus. I love your school days posts, it’s so lovely to hear how your little one is getting on. The pancake races sound fantastic!